ISTANBUL (AP) — The mood among opposition supporters in Turkey’s biggest city is one of jubilation but also worry – fear that their win in Istanbul’s mayoral race could be overturned in a recount taking place after the ruling party challenged the election results. In an unexpected setback to President Recep Tayyip Erdogan, the opposition snatched away his ruling party’s quarter-century-old stronghold of Ankara, the capital, in Turkey’s local election last Sunday. The opposition also won a tight race in Istanbul, the country’s financial and cultural capital, where Erdogan himself rose to power as mayor in 1994. The opposition made these gains despite an election that international observers say was not fair. Turkish media covered Erdogan’s constant campaign appearances on behalf of his party but did not give remotely similar coverage to opposition candidates. Joy over opposition candidate Ekrem Imamoglu’s razor-thin win in the Istanbul mayor’s race has given way to concerns after the ruling Justice and Development Party, or AKP, contested results in all of Istanbul’s 39 districts, alleging fraud and demanding a recount of votes deemed invalid. Turkish electoral authorities, whose independence opposition parties have questioned in the past, allowed recounts in at least 18 Istanbul districts. The AKP’s candidate for mayor, former Prime Minister Binali Yildirim said Friday the gap in votes between him and rival Imamoglu had dropped from about 29,000 to approximately 18,000. Imamoglu tweeted that he was still leading by 18,742 votes. 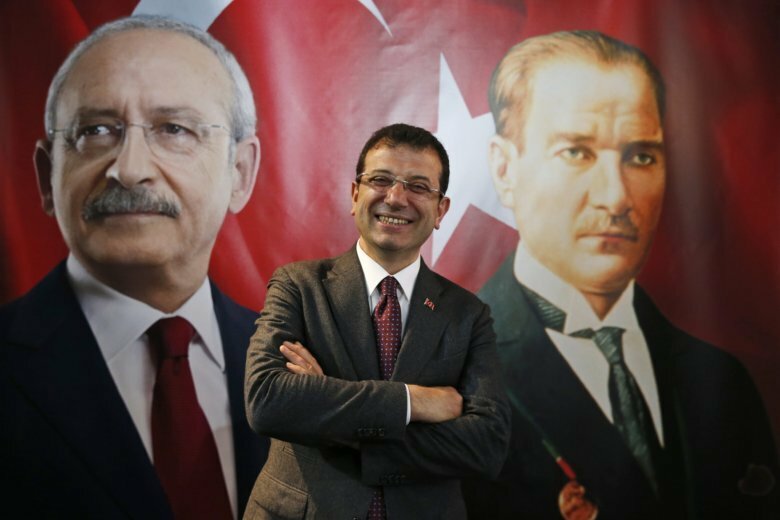 Imamoglu’s backers denounce what they see as different rules for the ruling party and the opposition, recalling that similar appeals by their secular Republican People’s Party were derided and rejected in past Turkish elections. Meanwhile, opposition parties’ appeals for recounts at least two other tightly contested races elsewhere were once again rejected. “The problem is not the recount of votes, but the rejection of objections when the (AKP) wins, and their acceptance when it loses,” Deniz Zeyrek of the opposition Sozcu newspaper wrote on Twitter. Erdogan, speaking after Friday prayers, said it was natural for his party to challenge the vote. He said the electoral board was the “boss” of the legal process and emphasized that his alliance had won a majority of the votes nationwide. Erdogan also slammed the United States and European countries, accusing them of meddling in Turkey’s internal affairs by commenting on the election. In Istanbul’s fashionable Cihangir neighborhood, 60-year-old antique dealer Huseyin Guney, expressed concerns that the mayor’s post will be wrested away from Imamoglu. “After all, it’s just a local election and (Erdogan) still runs the country,” he noted. Saban Ozmen, a neighboring shop owner, welcomed a change in Istanbul. But Erhan Celik, who voted for the ruling AKP party, defended the recount. “Irregularities occur in elections, they have occurred, are occurring, and there are mechanisms against this and those will be set in place,” he said. That comes in stark contrast with past statements from Turkish government officials, who dismissed allegations of foul play in recent elections and insisted that Turkey’s electoral system is fair. Media outlets close to Erdogan have claimed that AKP votes were stolen as part of an alleged “coup” against the ruling party. The AKP, meanwhile, put up posters around Istanbul featuring the pictures of Erdogan and the AKP’s candidate for mayor there, former Prime Minister Binali Yildirim, and thanking residents for their support. Many saw the move as a premature declaration of victory. Yildirim had declared victory on Sunday before acknowledging that Imamoglu had a narrow lead. Imamoglu, a 49-year-old former businessman and the little-known mayor of the Istanbul district of Beylikduzu, promised to build bridges in the highly polarized city. He even visited Erdogan in Ankara and asked for his vote too. He has drawn ire among AKP officials for signing a visitor’s book at the mausoleum of Turkey’s founder in Ankara as “The Mayor of Metropolitan Istanbul” before the election results were finalized. Yildirim urged Imamoglu to await the results of the recount. “Be patient, brother. In three or five days, if it is your right, you’ll take this title,” Yildirim said. Fraser reported from Ankara. Zeynep Bilginsoy in Istanbul contributed.